Join us Every Monday 7pm for Meditation and Discussion 65 N Main Street in Yardley PA.
We were delighted to have Rebecca Li back to the Yardley Friends Meetinghouse this past Monday, February 13th. One reason we attend Dharma talks is to learn about Buddhism. Part of the learning is reinforcing concepts we’ve been introduced to and building on that understanding. Often times it’s reminding us of a simple, yet powerful topic. If the causes and conditions are there, such as your own focus and awareness coupled with a wonderful teacher like Rebecca, then good experiences prevail. Leading up to Monday’s talk, I’d been caught up in the cyclic trials and tribulations of life. Rebecca’s simple and direct speaking style immediately pulled me in. Her academic background is apparent and it was great to see her in action as she took the topic at hand–the need for the proper causes and conditions to be in place in order to have a desired outcome–and rather than allow the conditions of the moment (dim lighting) upset her she turned it on its head and used it as a teaching opportunity. The topic of Rebecca’s talk was Interdependence: Embracing Life’s Ups and Downs with Equanimity. Listen to the audio recordings above for an outstanding dharma lesson. 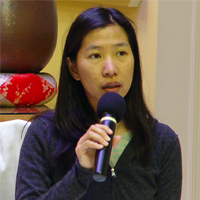 Rebecca Li is a Dharma and meditation instructor teaching at the Chan Meditation Center(CMC). Rebecca leads Chan practice at Rutgers University and the New Jersey chapter of DDMBA and teaches on behalf of Dharma Drum in various community activities in the NJ-NY area. Rebecca is a board member of the Dharma Drum Retreat Center and professor of sociology at The College of New Jersey. This entry was posted in buddhism, Home and tagged audio, dharma talk, rebeccali. Bookmark the permalink.